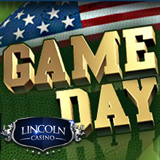 With a new game, two big slot tournaments and a bunch of casino bonuses this is a good time to check out Lincoln Casino Just in time for the NFL draft they've added a new football-themed slot game called Game Day. With a betting range from $.01 to $200 per spin, this one has all the excitement of a last minute touchdown. Game Day is a five reel twenty-payline game with quarterbacks, cheerleaders, whistles, goal posts and of course footballs spinning on its reels. The scatter symbol awards 15 free spins where winnings are tripled. Enjoy this game with a minimum bet of just a penny or wager as much as $10 per line for a spine tingling max bet of $200. The jackpot is $450,000. The “April Shower of Cash” slots tournament ends Saturday at when $15,000 in prizes will be awarded. Then the $15,000 “Spring Money” tournament starts Sunday and continues until April 30th. Next week, Lincoln is offering the Easter Weekend Match bonus - 100% up to $500 April 18-21 -- which, coupled with their regular Thursday and Saturday bonuses can add up to $1000 bonus cash. All month earn double Comp Points when you play Lincoln's most popular game, Amanda Panda and the Jackpot Journey.